This maelstrom has been at its fiercest over the last few days as Greek MPs prepare to vote on the Prespes Agreement, the diplomatic settlement that seeks to settle the longstanding dispute between Athens and Skopje and which will lead to Greece’s neighbour being renamed North Macedonia, if the deal is ratified. Passions are running high, which usually kills off chances for reasoned discussion. But to compound matters, the public debate in Greece has become littered with references to historical events (some of which are disputed, while others are obscure), border movements over thousands of years, linguistics and religion. Trying to make sense of all this is an impossible task and all it promises is a tortuous journey through rabbit holes. Added to this is the toxicity of current Greek politics, which has poisoned the public discussion and seeped into every corner. Beyond the politicians’ slanging matches, much of the commentary on the subject lacks honesty. Many journalists, opinion writers and academics who are favourably predisposed to Alexis Tsipras and SYRIZA laud the deal without a second thought, while those who cannot stomach the prime minister and his government lambast it. Blind faith/rage are not useful companions on the exacting journey undertaken by anyone trying to navigate this subject. There is, though, a way to tiptoe between these pitfalls. If one sets aside the burdensome (although clearly important) history and the volatile politics that this issue entails, some vital questions can be addressed and, perhaps, answered. Much of the discussion about the Prespes Agreement, which will also lead to North Macedonia’s language being recognised as “Macedonian” and its people as “Macedonian/Citizen of the Republic of North Macedonia,” centres on whether the deal is good or bad, and whether a better one could have been reached. Obviously, this is a subjective assessment but there are certain political realities that cannot be ignored. Since this issue became a diplomatic conundrum, after the Republic of Macedonia (or Former Yugoslav Republic of Macedonia/FYROM as Greece refers to it and the name under which it was admitted to international organisations such as the United Nations) declared independence from Yugoslavia in 1991, many efforts have been made by both sides, under the auspices of the UN, to reach a compromise. Any proposals put forward by mediators were seen as too much of a step back by one side or the other. Eventually, under the leadership of nationalist VMRO and its leader Nikola Gruevski between 2006 and 2016, Skopje made reconciliation virtually impossible by launching a programme of cultural and historical appropriation, epitomised by the liberal use of Alexander the Great’s name for everything from airports to roads and the garish statues and buildings that were erected in Skopje. In 2008, Greece blocked FYROM’s bid to join NATO even though the International Court of Justice later found that this veto contravened the 1995 Interim Accord between the two countries, which allowed Skopje to join international organisations of which Greece was a member under the FYROM name. Given the mixture of false dawns and bad blood over a period of almost 30 years, it is safe to say that since the election of Zoran Zaev as prime minister in 2017, and given Alexis Tsipras’s premiership in Greece, there have never in the history of this diplomatic conflict been leaders or governments in the two countries that are keener to reach a resolution than now. Zaev made his intention to launch a new diplomatic drive clear from the start of his premiership, while SYRIZA had traditionally taken a more flexible stance on the name issue than its political rivals. This positivity towards finding common ground was evident in the relatively quick time that the two sides were able to reach an understanding, overcoming obstacles that had tripped up their predecessors. And yet, despite the strong will in the two camps for a deal, getting the Prespes Agreement (and the constitutional revisions required in Skopje) over the line has proved an almighty task for both leaders. Zaev’s centre-left coalition had only 72 out of 120 MPs and he needed to find at least another eight lawmakers for the two-thirds majority required to ratify the name deal and launch the revision of the constitution. He managed to achieve this, but only just. There has been much speculation about what methods were used to convince eight VMRO deputies to back the government, but let’s set that discussion aside for a moment and focus on the fact that Zaev did not have a single vote to spare to seal the deal on his side. Furthermore, the ballot was held just days after a referendum on the Prespes Agreement in FYROM. Although more than 90 percent of voters backed the deal, participation was just 36.8 percent, well below the 50 percent needed to make the vote valid. Just the fact that the plebiscite was non-binding allowed Zaev to proceed with the process. The developments and numbers from across Greece’s northern border tell a simple story: Zaev has gone to the absolute maximum of what is politically possible in his country to approve the agreement. In Greece, the picture is similar. Since the Prespes Agreement was in the offing early last year, there have been several large public demonstrations (rivalling anything seen during the economic crisis) against the deal. Sunday’s rally included an apparent attempt by the far-right to force its way into Parliament, while MPs and ministers have been threatened. Opinion polls suggest that roughly seven in 10 Greeks oppose the diplomatic pact. Although some of this reaction is the result of extremists and opportunists trying to exploit people’s sensitivities or ignorance of the issue, Tsipras is taking a considerable political risk in pressing ahead with the settlement as there is genuine and widespread resistance. 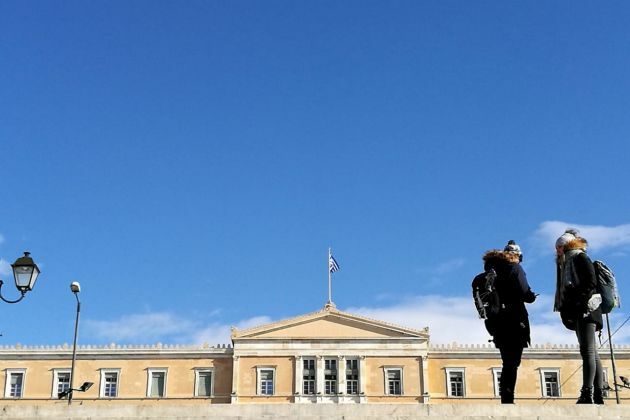 Over the last few days, Tsipras’s coalition partner, Independent Greeks (ANEL) Panos Kammenos, has walked out of the government due to his declared opposition to the name deal. Theatrics aside, this meant the SYRIZA leader had to find a new parliamentary majority last week, which he did by just one vote (151/300). The Prespes Agreement is expected to be passed with the support of up to 153 MPs. Not much room to spare there, either. In summary, despite having governments in place in both countries that are the most eager for three decades to solve the name dispute, the result of their compromise is only going to be approved by the thinnest of majorities and with weak support from the respective publics. Unlike other aspects of the discussion about the name issue, this cannot be countered or denied – Greece and FYROM have reached the outer edges of what each side can give to lay the issue to rest. This means the debate about whether there could have been a better deal for either side is academic. Political necessity and diplomatic reality mean that a different compromise to the one set out in the Prespes Agreement would probably have foundered in one or both countries. Whether people like it or not, Prespes is what is currently viable, and those are the only kind of settlements that diplomacy and politics can deal in. Clearly, Greeks are free to dislike the Prespes Agreement even though events over the last few months show that neither Skopje, nor Athens could have squeezed more out of the other side. Not all those who oppose the arrangement are staunch nationalists, and critics of the treaty have raised some well-founded concerns about some of the concessions being made and whether the deal will be sustainable over the long-term. However, they should also be clear about what the alternatives are likely to be. This aspect is glaringly absent from the public debate within Greece. Should the current attempt to reach a compromise fail, it will become clear to the international community that there is little prospect of this dispute being solved soon, or at all. Given that there are already concerns about Russian interference in Skopje, the onus will be on NATO and the European Union to bring FYROM within the fold. Due to the ruling against Greece in The Hague in 2011, it has been made clear that Athens cannot block this process again if Skopje applies for membership under the FYROM moniker. This means that Greece’s neighbour will be free to join NATO, and perhaps then the EU (although the latter will be a much longer process), in a way that does not breach the interim accord with Greece and leaves Athens with no legal recourse to block the procedure. Greece would find itself in a surreal and lonely position within the transatlantic alliance, whereby all the other members would recognise the country by its constitutional name, Republic of Macedonia, but Athens would call its fellow NATO member by a different name. Worse than that, though, Athens would also lose the only real leverage it has over its neighbour in the effort to settle their differences. Smoothing FYROM’s passage towards NATO and EU membership has been the carrot dangled in Skopje’s direction during negotiations over the name issue. Without it, Athens would have to direct its diplomatic efforts at convincing NATO and EU partners not to accept FYROM’s membership. This would be extremely unpleasant and taxing work for any Greek government, which would find itself burning a lot of goodwill in the process. There is, of course, the possibility that FYROM will turn the other way and give up on efforts to join the EU and NATO, looking elsewhere for support or patronage. Developments within the EU and the resistance to further enlargement from some member states mean that the window of opportunity for FYROM to join the Union could slam shut in the near future. This could prove an even more damaging scenario for Greece, which might end up with a satellite state sitting on its northern border. One of the criticisms against the Prespes Agreement is that it does not completely shut the door on potential irredentism or agitation from the north (mainly due to the recognition of a Macedonian language and nationality) but if this is a genuine fear, then those who share these concerns should be petrified about the possibility of having as a neighbour a country that does not share key international institutions with Greece and is potentially susceptible to outside influence, with whatever implications this also has for the close economic ties that currently exist. It is clear by now that there are no easy solutions to the diplomatic and political puzzle that history and geography have thrown in Greece’s path. But what we can be relatively certain of - since the Prespes Agreement has barely survived the parliamentary process in the two countries - is that there is no scope at the moment for an alternative deal to the one on the table. The question here is what is viable, rather than what is better or worse, difficult as that may be to accept. Beyond that, the potentially damaging consequences of not ratifying this settlement must also be considered. Without the current deal, FYROM could apply for NATO and EU membership, leaving Greece isolated, or it could turn its back on both and become a potentially troublesome neighbour. The position Greece is in means there are no easy choices but denying this truth is not going to make the process any simpler. To do so would be foolish, if not dangerous.